Nothing like throwing one's back out to totally knock you off of your regular habits. A few weeks ago I went from very active (teaching 8+ gym classes a week) to very old (needing my partner to put on my socks for me). Unfortunately this blog was set aside for a bit as I hobbled my way back to a healthy back again. Surprisingly, there was gaming that still happened with the help of a lot of standing up and walking around during other people's turns. And I even got in my first game of Eclipse. 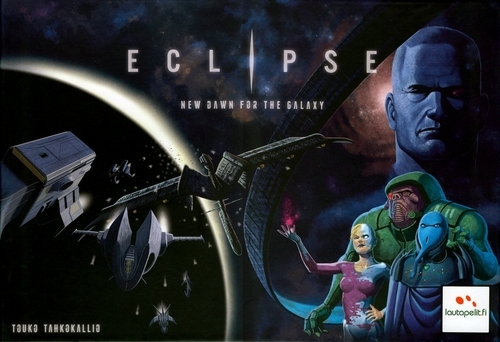 If you haven't heard of Eclipse, it's basically Twilight Imperium if it were designed by a German - that is, a big space exploration with lots of Euro cube pushing mechanics. It's a big, long game (our 4-player game clocked in at 4 hours without the rules explanation) and it's quite involved. The rules are quite daunting but actually come together quite nicely once you start playing. It helps that the goals in the game are fairly clear from the get-go: mine planets, get awesome spaceships, destroy the ancients, and then if you can, destroy everybody else. Oh yes, it's THAT kinda game. Player elimination is possible, probably unlikely, but in a 4 hour game this is one of a few problems I have with it. Another is that everyone seems to explore the map separately so despite the randomness of the tile draws, I feel like the story arc of the game will be quite similar, one game to another. It doesn't seem like there would a be a lot of variety. I suppose the extra alien powers will add to the way players expand their technologies but I still imagine the first half of every game consists of everyone expanding out from the center in their own little direction until the tiles finally run out. But what do I know? At Tao of Gaming, Brian Bankler says he's played the game at least 25 times and he's pretty darn fussy. So I would definitely play it again but not with more than 4 people. An hour a player is more than enough and I don't see it getting any quicker as were moving pretty fast in our first game. في بعض الأحيان قد لا تكون حلول النمل الأبيض وحاجز النمل الأبيض متاحة ، وفي هذه الحالة يجب اتباع المسار التقليدي للتحكم في النمل الأبيض للمساعدة في إدارة مشكلة النمل الأبيض.